Top holdings and new trades for Fairholme Capital Management. At The Motley Fool, we understand that it often pays to zig when Wall Street zags, but that doesn't mean that we don't pay attention to what leading fund managers are buying and selling. And hedge funds, which are rarely in lockstep with the broader market, can be a particularly valuable source of insight. Every quarter, fund managers overseeing more than $100 million must disclose their quarter-end holdings publicly by filing Securities and Exchange Commission Form 13-F. The form lists all U.S.-traded securities the manager held at the end of the quarter. Although the form doesn't disclose the manager's short positions or intraquarter trades, it can shine a bright light on his or her long stock bets. To help us make use of 13-F data, we turned to Motley Fool partner AlphaClone, a research and investment-management firm that tracks hedge-fund public disclosures and develops investment strategies based on them. Bruce Berkowitz founded Fairholme Capital Management in 1997. The firm invests in the public equity and fixed income, distressed or defaulted bonds, and value stocks for its affiliated mutual funds, institutional managed accounts, and private funds. The total market value of Fairholme Capital Management's disclosed equity holdings as of Dec. 31, 2010 -- the latest quarter for which data is available -- was $15.8 billion across 24 holdings. Outside the top 10 holdings, the fund also increased its positions in Berkshire Hathaway and MBIA while reducing its exposure to Humana and Wellcare Health. During the quarter, the fund sold out of two stock positions: AmeriCredit and TAL International Group. Current winner: AIG did extremely well, increasing 47% in the fourth quarter of the past year. The stock comprises fully 16.2% of the total portfolio. 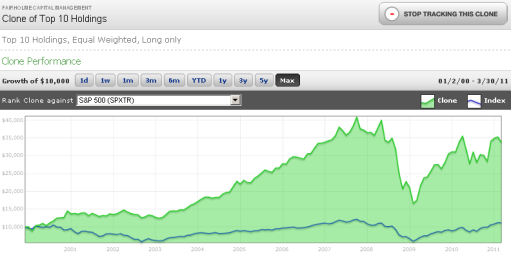 Current loser: St. Joe fell 12% in price in the fourth quarter of 2010. More recently, though, the stock has turned around, as Berkowitz became the chairman of the board about a month ago to help the ailing real estate development company recover. New bets: The largest new addition, General Growth Properties, comprises 11.1% of the total portfolio. General Growth is a real estate investment trust. During the quarter, the fund also started new positions in AT&T, Verizon, Banco Santander, and Royal Dutch Shell. So there you have it -- the blow-by-blow of Fairholme Capital Management's latest moves. Tell us what you think in the comments section below. Company data provided by AlphaClone LLC, a San Francisco-based research and investment-management firm that tracks hedge-fund public disclosures. For more information on the firm's investment approach, visit AlphaClone. Backtesting is the process of evaluating a core strategy by applying it to historical data. Backtested performance results are provided for purposes of illustrating historical performance had a core strategy had been available during the relevant period. Backtested performance results are hypothetical and have inherent limitations. AlphaClone makes no representation that any core strategy will achieve performance similar to any backtested performance results. Actual results could differ materially from backtested performance, and future results could differ materially from backtested performance. Past performance is no indication or guarantee of future results.